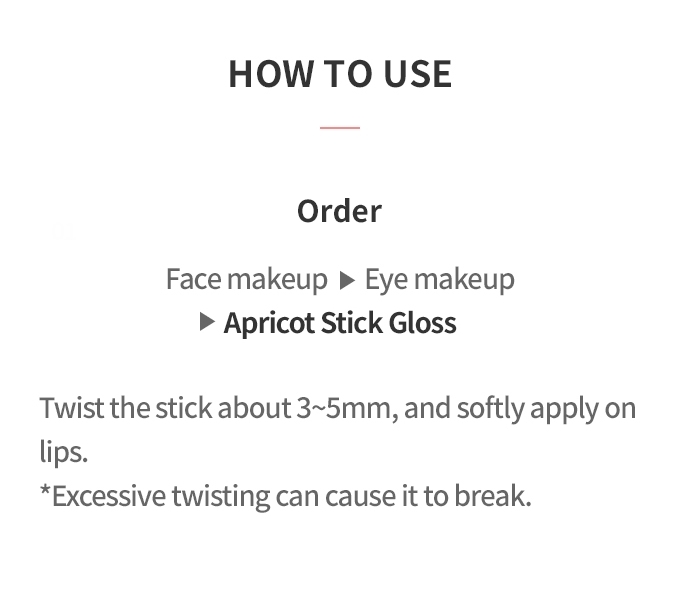 Apricot Stick Gloss for moist and fruity lips. Its so nice! Its not super glossy its like perfect amount of gloss, I love the scent too. Nice and subtle. I use it on my cheeks for blush too and its great! I would definitely recommend. Im buying another for my sister as well. I would not buy for over that. It is the same as drug store regular color balm, but in a smaller container. I have several of these but my favorite is 8. It is moisturizing and adds a healthy sheer red look to my lips. I have ordered and finished two 8 so far. Great for a soft gloss touch. Color is natural looking and it leaves lips smooth and moisturized. I have #3 & #7 and I love both of them very much. The color is so natural and looks very glossy on lips. It smells sweet and glides on lips smoothly. I wish they are more colors available. Great product! Highly recommended! Forgot to mention in my previous review that this product is actually very glossy which is a good point. I definitely recommend people to buy this product. You'll be amazed with the quality :)! Smells amazing! Has a nice, natural-looking, soft colour. Best of all it has a reasonable price for it. Will definitely purchase again. I really like the color! It even looks good with my pale complexion and it stays on pretty long too, also nice smell. It doesn't dry up my lips like other glosses. Smells really good, more like a chap stick with color or tint. Looks natural specially if you just dab some on your center lips. Although this item it was suppose to be a lip gloss but it serve more like a chap-stick when you put it on which is the reason why I love it. It's a good quality lip gloss for a good price. Good for those who are like me who doesn't really like sticky lip gloss.